ELLSWORTH — Covenant Community Land Trust is hosting a meeting on affordable home ownership in Hancock County on Thursday, April 19, from 5:30-6:30 p.m. at the Ellsworth Public Library. Covenant Community Land Trust was founded in 1978 in response to poverty and growing income inequality in Hancock County. The organization holds title to land and houses are sold with a 99-year ground (land) lease and shared equity program that provides the mechanism for maintaining long term affordable home ownership for income-eligible families. There are 26 homes that were built on land leased from the land trust located in five Hancock County towns. Most of these homes are owner-occupied, but a few will be available for resale in the coming months and years. This meeting is for those who wish to learn more about the organization as well as those interested in applying for home ownership on leased land. 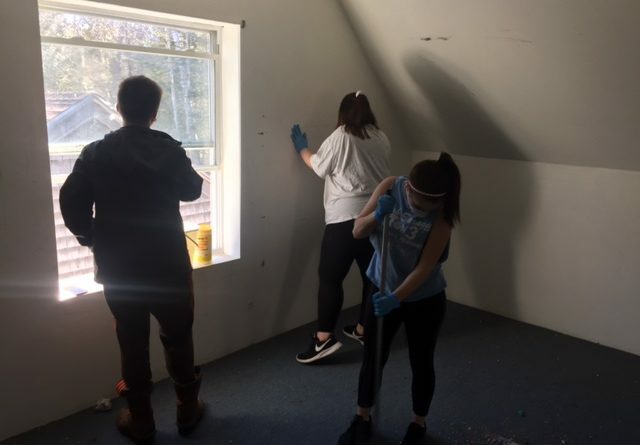 Pictured Volunteers – Angelo (AJ) Sullivan, Breanna Sullivan and Makayla Gray help prepare home in Sedgwick for renovation and future sale. For more information, visit www.MaineCCLT.org or call Carol Roberts at 667-6715.